Even though the ranch was isolated for those who lived there, it was in the perfect location for Link whenever he felt the calling of a warm meal and a good song. The Zelda Project is a Los Angeles, CA based group of friends who seek to bring to life the characters, settings, and overall feel of Ocarina of Time through photography and film. Our ultimate goal is to create the characters as they would appear in reality to the best of our abilities, placing them in beautiful sceneries true to their Hyrulean counterparts, and creating elaborate photosets, as well as a film short (coming once the cosplay segment of the project is completed!). Link Model: Anthony Beaston "Lune"
The boots, gloves, and belts are all real leather. The sword and shield are made with a number of different materials including high density foam, fiberglass, and resin. The matte painting of the ranch was a beautiful job done by Mickael Forrett to bring Lon Lon into reality. Epona also is wearing make-up. Big John didn't have the dark spots on his legs, so we painted them with horse show touch up paint to give his legs that gradient effect. Stay tuned for our BTS video for more about the ranch shoot! 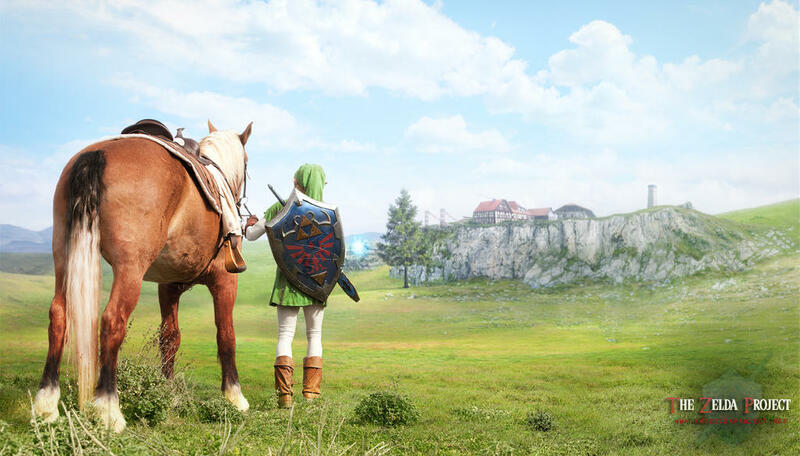 Lon Lon Ranch was my favorite place to go when I played Ocarina of Time. Throughout the years as the game held up to it's replay value, it still was where I liked to take Link to hang around. Something about it held a really warm and special place in my heart, and I imagined that despite it's isolation, it's central location in Hyrule Field made it a perfect place for Link to stop and eat, hang out, and sleep in a cozy bed.